Guinness' newly crowned 'tallest man' wants simple things in life — but standing over 8 feet tall makes even normal routines a bit more complicated. Sultan Kosen from Turkey stands in front of Tower Bridge in London. 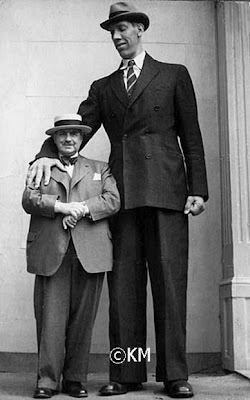 He was officially crowned the world's tallest man Thursday, Sept. 17, 2009 after his Ukrainian rival dropped out of the running by refusing to be measured. Guinness World Records said Kosen stands at 8 feet, 1 inch tall. Standing at 8 feet, 1 inch tall, however, popping out to the shops is a little harder. But, newly crowned by Guinness World Records as the tallest man in the world, Kosen, from Mardin in southeast Turkey, is hoping that life will become a little easier. In his own words, “The first thing I want is a car I can fit into,” he said. “More than that, I want to get married. It’s really difficult to find a girlfriend. They are usually scared of me.”. He smiles. Job Henderson, 11, was “shocked” at Kosen’s feet which, at 14.3 inches long, are also officially the world’s largest — as are his hands, at 10.8 inches long. Neither child wanted to grow up to be so big. “You couldn’t really run or jump or anything,” Marley said. His pituitary gland, damaged by the tumor, was producing too much growth hormone and Kosen became taller and taller. When other children were little more than 4 feet, he was already well over 6 feet tall. 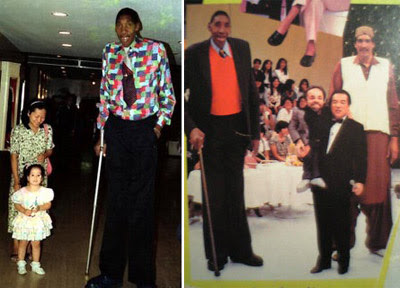 Gabriel Estêvão Monjane (1944 – 1990) is one of only a dozen individuals in medical history to have reached 8 feet or more in height. He remains perhaps the tallest African yet known. Born in Manjacaze, Mozambique, Monjane’s abnormal growth started soon after birth. By the time he was 17, Mojane stood 7 feet 10 inches. He joined a Portuguese circus around this age, and was billed as 8 feet 8.3 inches. When measured officially in 1987, Mojane was attributed with the height of 8 feet and three quarters of an inch. He also weighed 29 stone 12lbs. Väinö Myllyrinne, (1909 - 1963) was an acromegalic giant who was at one time (1961-3) the world’s tallest person. He stood 222 cm (7 feet 3.5 inches) and weighed 197 kg (31 stone) at the age of 21, but experienced a second phase of growth in his late thirties, attaining a height of 247 cm (8 feet 1¼ inches). Leonid Ivanovych Stadnyk (born 1971 in Ukrainian) is a man who is formerly listed as the world’s tallest living man according to Guinness World Records 2008. He is 2.57 m (8 ft 5 in) tall. 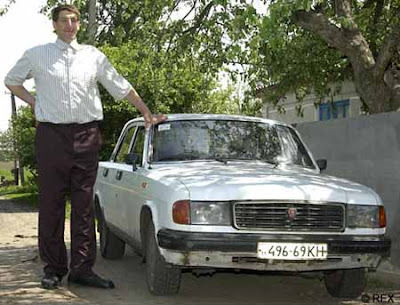 On August 20, 2008, editor-in-chief of Guinness World Records, Craig Glenday, announced that the title of world’s tallest man returned to China’s Bao Xishun after Ukrainian Leonid Stadnyk refused to be measured under new guidelines, which required him to be independently measured by Guinness World Records adjudicators. 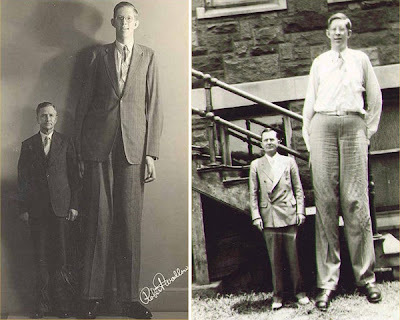 Robert Pershing Wadlow (1918 – 1940) was a man who, to this day, is the tallest person in medical history for whom there is irrefutable evidence. He is often known as the “Alton Giant” because of his Alton, Illinois hometown. Wadlow was noted for having the largest and broadest hands ever in recorded history being capable to hide a 2-litre bottle of soda in them easily.